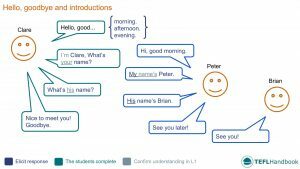 A collection of ESL activities and resources for teaching introductions to beginners (A1). This lesson plan serves as an excellent first lesson/ice-breaker and includes suggested board work, as well as some fun and practical ESL classroom activities and games. The best way to view this content is through the TEFL Handbook app. So if you have an iOS or Android device, be sure to check it out. Use the sample ESL board work below as a lead-in activity to introduce the students to the target language. These boards are colour-coded to give you an idea of the teacher-student interaction. Any text in blue is an opportunity to elicit a response from the class. A role-play activity where students get to know each other while practising the target language for this lesson. In groups of three, students will come to the front of the class to act out the dialogue from the suggested board work. Students move around the classroom, learning as much as they can about their classmates. Next, give the students 5-7 minutes to mingle with as many of their classmates as they can. When they find a new partner, they should take turns getting this information from one another. We find out how much your students learned from the previous activity. 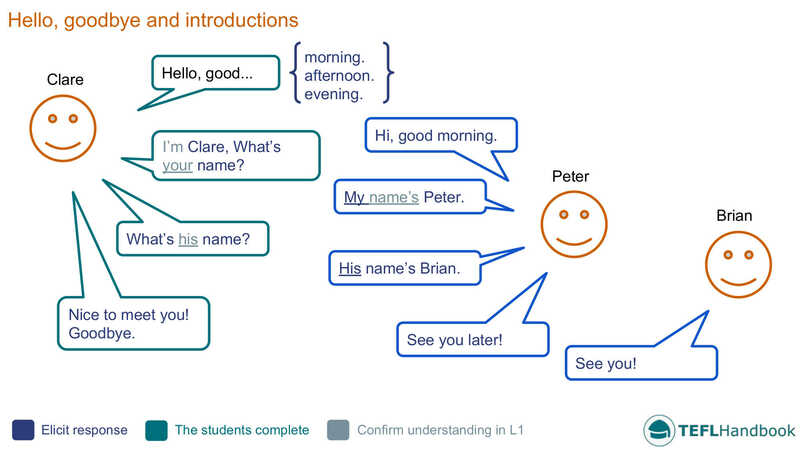 You will now have the students help you to introduce different members of the group. Select a student at random and ask the class questions about that student using the prompts from the last activity. Encourage the rest of the students to raise their hands and answer using the correct possessive adjective (his or her). If it's practical, you should try to do this for every student in the class. Students answer questions about their classmates to earn a throw of the snowball and a chance to win points for their team. The students should answer using the correct language rather than single word answers. If they get it right, they can throw a snowball at the board. Keep the scores on the board, and depending on the size of the class, play as an individual or team game. teach-this have a comprehensive list of introductory games for all ages and levels. If you're looking for a free ESL worksheet to test your students, Let me introduce myself from islcollective will do the job. Add video and music to your EFL lesson plans. This video from Mark Kulek goes over basic introductions and how to ask for and give information about yourself. We hope that you've found a few of these ideas useful. Our suggested next lesson is on "What's this" style questions. Be sure to check out our complete list of ESL lesson plans for beginners (A1 Upper), as well as our entire collection of ESL lesson plans. If you need to bring these materials into the classroom for reference, the TEFL Handbook app gives you offline access to all of the ESL resources on this site, plus a lot more.